Stensland Farms (local) cheese curds, made fresh weekly! Absolutely Delicious! Served with homemade grilled artisan bread. DRESSINGS: Ranch ⓖ • French ⓖ • Blue Cheese ⓖ • Golden Italian • Thousand Island ⓖ • Asian Sesame • Honey Mustard ⓖ • Note: ⓥAll salads available without meat. Served with FreshFRIES or tater tots, hash browns, side salad, or soup at no extra charge. Swap your FreshFRIES for Onion Rings (+1.29), Cheese Curds (+1.49), Fried Pickles (+1.49), or Loaded Fries (+1.49, American cheese, pico de gallo & crumbled bacon). Homemade bun with lettuce, tomato & pickles “on the side." Ground beef, seasoning & bread crumbs pattied into 1⁄3 pound burgers and cooked fresh to order. 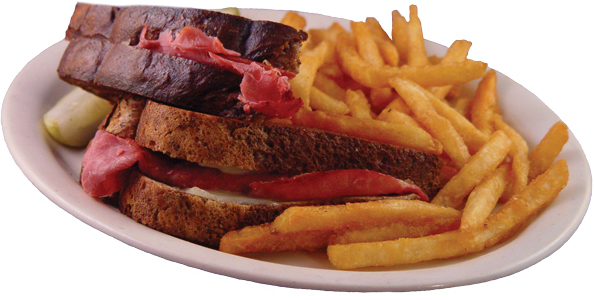 Served with FreshFRIES or tater tots, hash browns, side salad, or soup at no extra charge. Swap your FreshFRIES for Onion Rings (+1.29), Cheese Curds (+1.49), Fried Pickles (+1.49), or Loaded Fries (+1.49, American cheese, pico de gallo & crumbled bacon).